Building relationships and trust with those I support is key to the work I do. My work stems from the recovery model- which emphasizes and supports the person’s potential for recovery. With every person I work with it is my goal to bring hope into their lives. I value all I work with; I have confidence in them. I listen, validate and accept their experiences. I help them accept that setbacks are a part of recovery. I am always encouraged and proud when those I support have days, weeks, months and hopefully years of sobriety and stability– allowing me to see a demonstrated quality of life improvement because I had the honour of journeying with them in their recovery. I am the Drug Treatment Court Coordinator with the Mental Health and Justice Services Team. I specialize in Concurrent Disorders (mental health and addictions concerns) and provide consultation and education to the team, the agency and the community. I work very closely with the Waterloo Region Drug Treatment Court and its multi-disciplinary staff members. I conduct assessments for all of the participants of this specialized court and provide support and consultation to those on the wait list. My main role is to provide community support coordination to many of the participants of the treatment program (which is a 12-18 month long program). I create treatment plans which include harm reduction strategies, referral to residential treatment and other forms of long-term support. I develop techniques to assist the participants to be successful in completing the program’s expectations. I provide both tangible support (basic needs etc.) and therapeutic support (motivational interviewing strategies) on a weekly basis for every participant I support. Court sits every Wednesday– where an in-camera case review occurs prior to court proceeding. While in court, I sit before the Judge alongside of every participant as their week is reviewed and we discuss their case in open court. I follow up with the participants in the community to assist them as well as to monitor their compliance with the treatment recommendations made that week in court. #2. Why did you become involved in Mental Health and Justice Services? I have been working in the adult mental health and justice field for over 10 years. I became passionate about this specialty field when I volunteered in prison ministry while in high school. I started my career in 2003 working in Youth Corrections and became committed to making positive change in the lives of those I support. I furthered my education to be able to work with adults in the forensic system as well as specializing in concurrent disorders. #3. Have you always worked in mental health? I graduated in 2004 with my Bachelors in Counselling. In 2003 I began working for St. Leonard’s Community Services in Brantford in their open custody youth facility. I transitioned into a Release from Custody role for adults in 2006 within the same agency. I started my first position with CMHA Peel on their Mental Health and Justice Services team in 2007 and have been working in mental health and justice ever since. 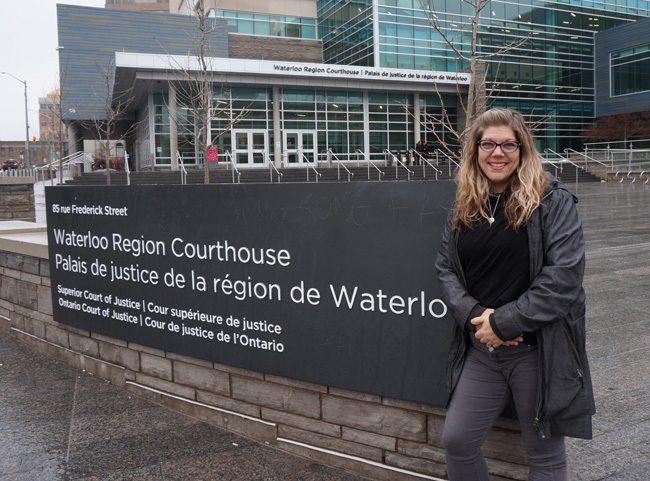 I came to CMHA Waterloo Wellington in 2014 as part of their Mental Health and Justice team- working with the individuals involved in the Mental Health Court. In 2015, I transitioned to the Drug Treatment Court Team and have enjoyed working in this diverse and complex field. #4. How do you support people in Drug Treatment Court? Building relationships and trust with those I support is key to the work I do. My work stems from the recovery model- which emphasizes and supports the person’s potential for recovery. With every person I work with it is my goal to bring hope into their lives. I value all I work with; I have confidence in them. I listen, validate and accept their experiences. I help them accept that setbacks are a part of recovery. I try to model empowerment by reflecting on their actions and encouraging those I support to take responsibility for their choices. I motivate them to have courage to take risks towards their wellness and advocate on their own behalf to do so. Managing wellness is a big piece of how I support an individual. We explore their insight and triggers and begin to understand its affect and role on their recovery. I encourage them to find wellness strategies and find sustainable, long-term supports in the community. As my time with an individual draws to an end, it is my goal that those involved in my care find meaningful roles for themselves. It is my goal that they continue to build autonomy, increase self-esteem, a healthy identity and competence in themselves. By building trust, rapport and a therapeutic relationship with those I support, I find I can be successful in helping them to find a way of living a satisfying, hopeful and contributing life even with limitations caused by the illnesses. #5. What do you enjoy about working at CMHA? I enjoy having the opportunity to work with complex individuals in an ever changing work place that focuses on quality improvement for not only those we support but for the staff as well. Seeing the results of the work the Mental Health and Justice team is doing in this community is so rewarding. #6. What are you particularly proud of during your time at CMHA? I am proud to be a part of the great team of professionals in Drug Treatment Court and especially in the Mental Health and Justice Services department. This team works together to support some of the most complex and high risk individuals with enthusiasm and innovation. The specialty and knowledge base required to navigate the legal system in tandem with the mental health care system is challenging yet rewarding work. I am always encouraged and proud when those I support have days, weeks, months and hopefully years of sobriety and stability– allowing me to see a demonstrated quality of life improvement because I had the honour of journeying with them in their recovery.